Bed bug bites are one of the murkiest areas when it comes to our knowledge of bed bugs: who reacts, when, and how? The latest research says most people do react to bed bug bites. The February 2010 issue of PCT Online reported the results of the latest study of bed bug bite reactions carried out by Dr. Michael Potter and Kenneth F. Haynes, professors at the University of Kentucky, along with the following pest control company owners, managers and technical experts: Kevin Connelly (A-Alert Exterminating, Chicago, Ill.), Michael Deutsch (Arrow Exterminating, Lynbrook, N.Y.), Erich Hardebeck (Permakil Pest Control, Covington, Ky.), Don Partin (OPC Pest Control, Louisville, Ky.), and Ron Harrison, (Orkin, Atlanta, Ga.). This data was also presented briefly at the ESA Meeting in December 2009. When asked the fundamental question: “Have you experienced any bites or skin reactions from the bed bugs in your dwelling?” 70 percent of respondents said “yes” and 30 percent said “no.” Interestingly, level of infestation had no appreciable effect on reactivity — about the same percentage of respondents reported having or not having a reaction whether they were living with low, moderate, high or very high numbers of bed bugs. Numerically more females than males said they were reacting to the bites but the difference was not statistically significant. No significant differences in reactivity were observed relative to ethnicity. There are no data to establish how frequently common [skin] reactions [to bed bug bites] occur. Older people were less likely to react to bed bugs. Significantly more people over the age of 65 reported no bites or skin reactions than those who were younger. Forty-two percent of the eldest individuals surveyed said they had no bites or reactions from bed bugs in their dwelling, whereas 26 percent of those aged 11 to 65 reportedly did not react. According to the article, this may be attributed to several factors: the elderly are less responsive to allergens, medications may suppress immune responses, and some medical conditions may also lessen awareness of bed bug bite reactions. Children aged 1-10 also reacted at a similar rate to the over-65 population (41%), but the sample size was not considered large enough to be significant. There was a correspondence between how sensitive people said they were to mosquito bites and how sensitive they were to bed bug bites: those reporting they responded to mosquito bites with larger welts also reported larger welts with bed bug bites. Of those who did experience bites or skin reactions, the majority (72 percent) mentioned having itchy red welts. Half (50 percent) said they experienced redness or discoloration and 28 percent indicated itching in the absence of welts. Twenty-one percent of those having a reaction also mentioned feeling a “pinprick” or “stinging sensation” which may or may not be symptomatic of bed bugs. In terms of bite location, most people reported being bitten on arms (84 percent) or legs (75 percent). Half of those reacting also mentioned being bitten on the chest or back (50 percent), neck (40 percent), hands (40 percent), feet (38 percent) or face (21 percent). Observations by University of Kentucky entomologists suggest that bed bugs have a difficult time biting through most clothing, which presumably is why bites tend to occur where skin is exposed. This last statement is interesting. In contrast, many of our readers and forum users report bed bug bites under clothing. Some have speculated this may be common because we tend to wear loose-fitting clothing when we sleep, and bed bugs likely are able to move more freely under loose clothing. Our readers have often commented on feeling the “pinprick” or “stinging” sensation, though many have also reported looking at the spot when it occurred and seeing nothing there; my own theory is that this may represent an allergic response which is delayed. Bite reactions can take a week or more to appear — especially if you are being bitten for the first time. We weren’t surprised that many respondents reported “additional maladies” such as insomnia/sleeplessness, anxiety, stress, and so on. If anything, I was surprised that only 31% did so. Anxiety, stress, sleeplessness and depression are medically important symptoms that can lead to other conditions. Dismissing bed bugs as “not a public health pest” on the grounds that they are unproven disease vectors ignores the pain, suffering and emotional distress inflicted on their victims. When government agencies finally concede this point, additional resources may be allocated to combat the problem, as they were years ago. This survey contributes greatly to the often-neglected area of bed bug bites and skin reactions, and serves as a reminder of how much is left to learn about this area. Finally!!!! SOme research. I would have loved to see time frames accounted for tho. WHat about people with periods of no exposure and then reintroduction? Severity of reactions? Any anaphylaxis in those surveyed? Progression of symptoms? 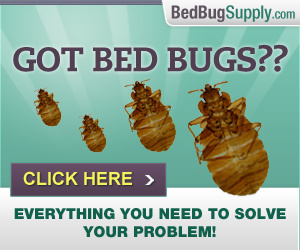 One problem with conducting research on bed bug bite reactions is that there are limited circumstances in which you can be sure people are being bitten by bed bugs. Another is working with people with current infestations tracked by a pest control firm, as happened here. The other side of the coin is that there are no situations where you can be sure people are not being exposed to bed bugs, since exposure can be unknown and can happen anywhere, any time.